As Oregon Republicans meet for the annual Dorchester conference, one key issue has to be reversing Republican losses. One overlooked factor is candidate quality. Here is an observation they should bear in mind: The government experience of the last four Republican nominees for governor, at the time they were nominated, is comparable to, and probably below, the government experience of the current four Republican Lane County commissioners at the time they were nominated. Kevin Mannix had the most. He had been in the state legislature for a dozen years. Ron Saxton had been a one-term Portland School Board member. Neither Chris Dudley nor Bill Sizemore had any significant government experienced when they were nominees. Sid Leiken had been Mayor of Springfield for nearly a dozen years. Pat Farr had one term as a state representative, a decade on the Eugene City Council, and, to top it off, had been a school board member before that. Farr gets at least a tie. Jay Bozievich had been a one-term community college board member. Faye Stewart had had no major elected office. The Lane County commissioners are definitely comparable to the Republican nominees. The point of this point is not so much to extol the virtues of the Lane County commissioners, but to point out the relative weakness of recent Republican nominees. The discussion of rebranding misses at least part of the point. The Republican gubernatorial nominees need to have done something to place on their resume or Oregonians won’t vote for them. One has to go back at least to 1956 with Robert Holmes to find a Democratic nominee with as little experience as Mannix. One has to go back to 1948 with Lew Wallace or 1946 with Carl Donaugh to find a Democratic nominee for Governor with clearly less experience. The question remains. Why do Republicans in heavily Democratic Lane County appear to have access to an equivalent, or better, talent pool for county commissioner than the statewide Republican Party does for governor? This question, unlike the one yesterday, asks about approval. Again, there is high support for the current site. Do you approve or disapprove of Eugene City Council decision to keep City Hall at its current site? This “approval” question was asked after the “support/oppose” question in the survey in order to minimize the bias in the latter. This question postulates a vote on the issue. 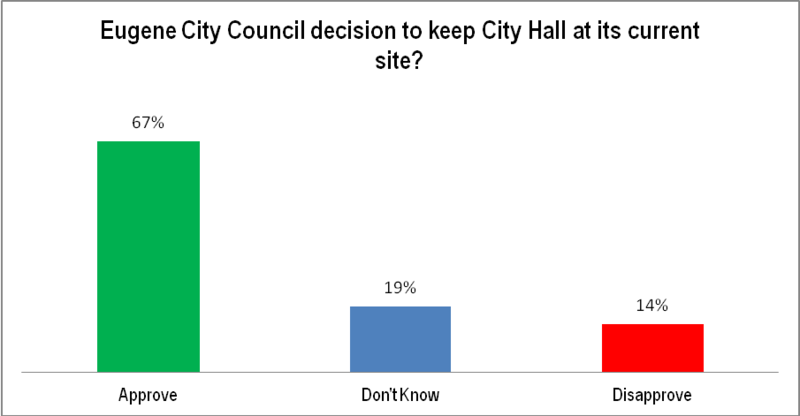 There is overwhelming support to keep City Hall at the current site. 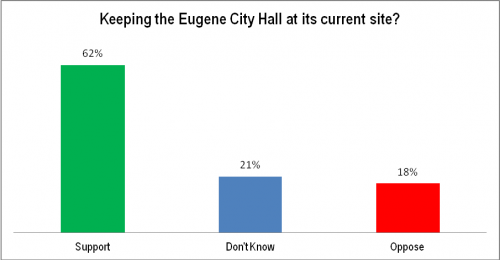 Do you support or oppose Keeping the Eugene City Hall at its current site? Strong support for the downtown public safety zone continues. 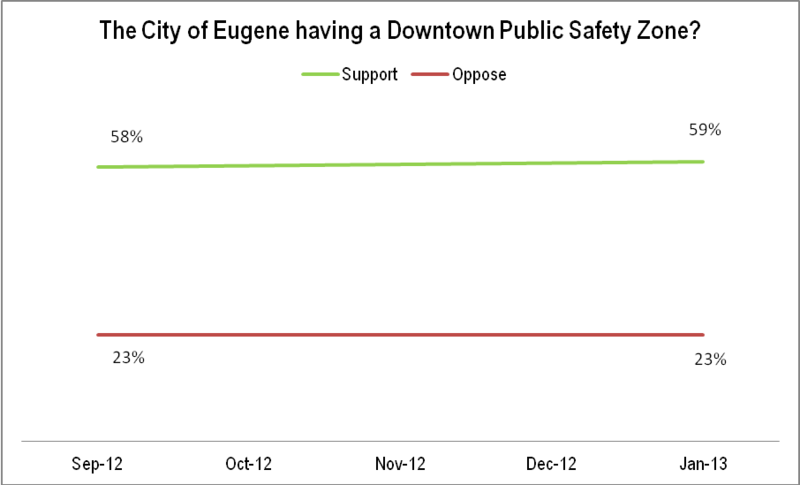 Do you support or oppose the City of Eugene having a Downtown Public Safety Zone? 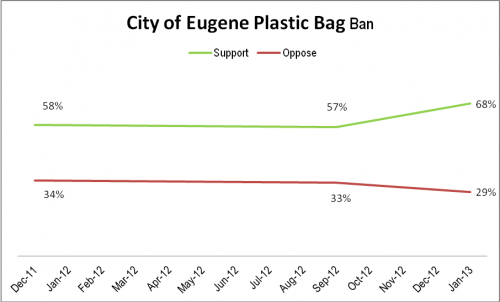 200 telephone interviews of likely 2012 Eugene General Election voters were conducted September 9-10, 2012 and January 23-24, 2013. The margin of error at the sample median for each survey is 7 percent. Favorability towards the plastic bag ban increased significantly after it was approved by the city council. Negatives remained constant. 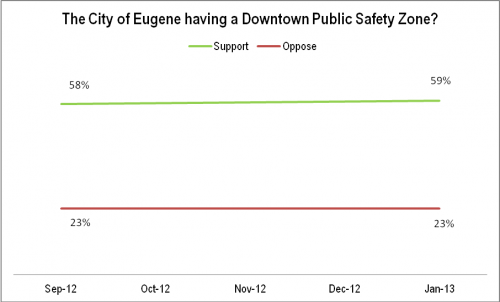 200 telephone interviews of likely 2012 Eugene General Election voters were conducted on December 5-6, 2011, September 9-10, 2012, and January 23-24, 2013. The margin of error at the sample median for each survey is 7 percent.